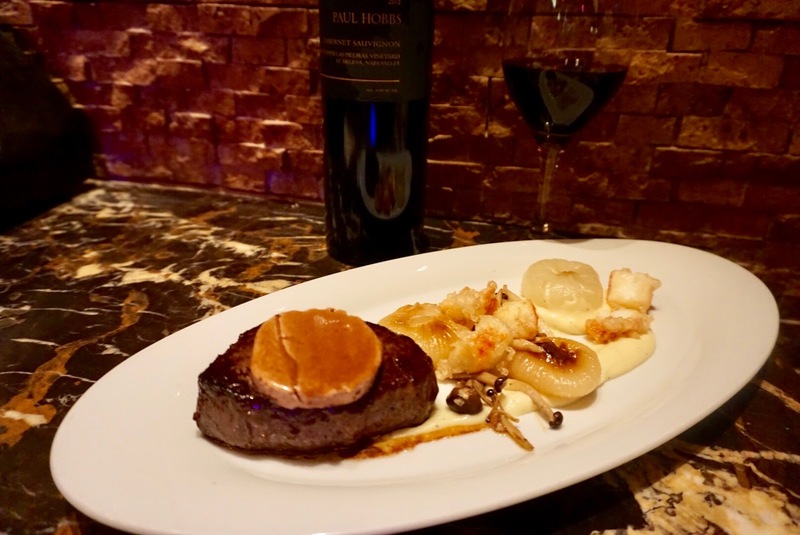 My husband Gabe and I recently had the opportunity to experience a Paul Hobbs wine pairing dinner at Council Oak, Seminole Hard Rock Tampa. Without a doubt, this was my favorite pairing dinner at Council Oak (and we have been to quite a few). Everything from the food to the wine was executed perfectly. The night started on the red carpet, or shall we call it the wine carpet. This particular dinner was extra special as it was on the 7th year anniversary of our first date. Seven years?! Crazy! We also got to dine with our friend, fashionista and PR goddess Nikki from Hard Rock Tampa. While we see her often at these events, we hardly ever get to sit down and spend time with her. Seriously, how cute is her outfit! The first course was off the chain. When I saw the menu, it noted: Chilean Sea Bass with Paul Hobbs Chardonnay Russian River Valley. 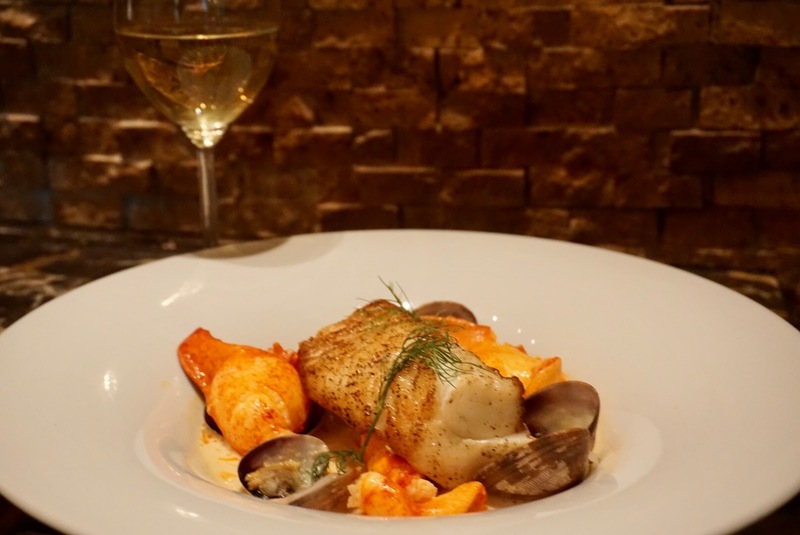 What I wasn't expecting was a perfectly prepared Chilean Sea Bass with giant chunks of Lobster, Manilla clams and a Pernod Cream Sauce. I would have been happy with just this meal alone! The Chardonnay - wow. I am a Chardonnay girl and love creamy butter bombs. The Paul Hobbs Chardonnay Russian River Valley drank perfect with the fish (it also drank perfect on it's own, I had quite a few refills of this one!). The second course, a Smoked Quail Ragù with shaved winter truffle was mind blowing delicious. 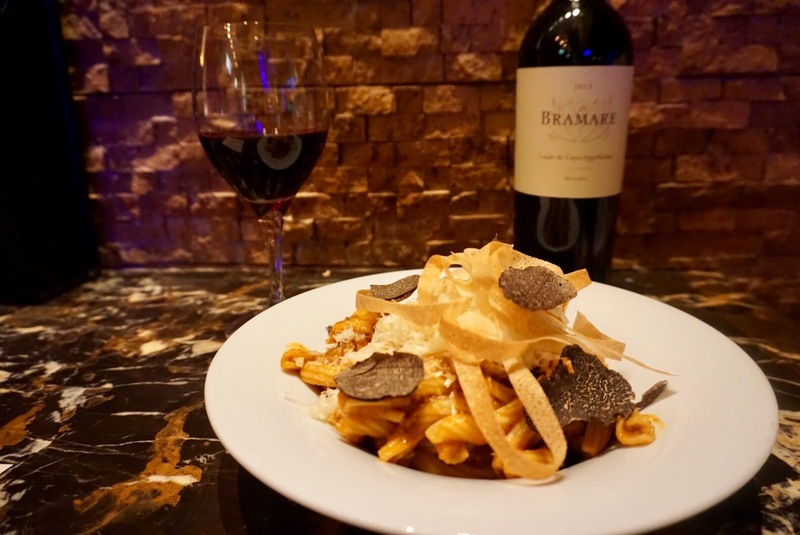 I am all about truffle anything and mix that with house-made Garganelli pasta and a glass of Malbec? Talk about perfection. The wine served with course two was a Bramare Appellation Lujan de Cuyo Malbec, Argentina. It was a perfect balance to the pasta. Oh course three.....I don't think any dish I will eat again will be as good as you were. This is depressing when I think that way. Without a doubt, this was the best plate and best wine I have ever had. The entree consisted of a Japanese Wagyu File Mignon topped with butter that was made with 4 bottles of the same wine we drank with the course - Paul Hobbs Beckstoffer Las Piedras Cabernet Sauvignon, St. Helena. This wine will be sold at Council Oak for $600 a bottle. So do your math on the cost of that butter. Served with tempura lobster at that. I cannot explain this dish in words. The steak literally melted in your mouth and was unlike any steak I have ever tried. I couldn't finish the steak and brought it home with me, butter and all. The final course was called Sweet Escape - Ice Wine sous vide Fiji Apple with salted caramel ganache and a white chocolate streusel. Say what!? Mad Scientist Pastry Chef Stephan Schubert did it again! Paired with a glass of Stratus Vineyard Ice Wine Riesling, Niagara-on-the-Lake. It was the perfect ending to a perfect meal. I want to thank Seminole Hard Rock Tampa for hosting Gabe and I at this dinner. 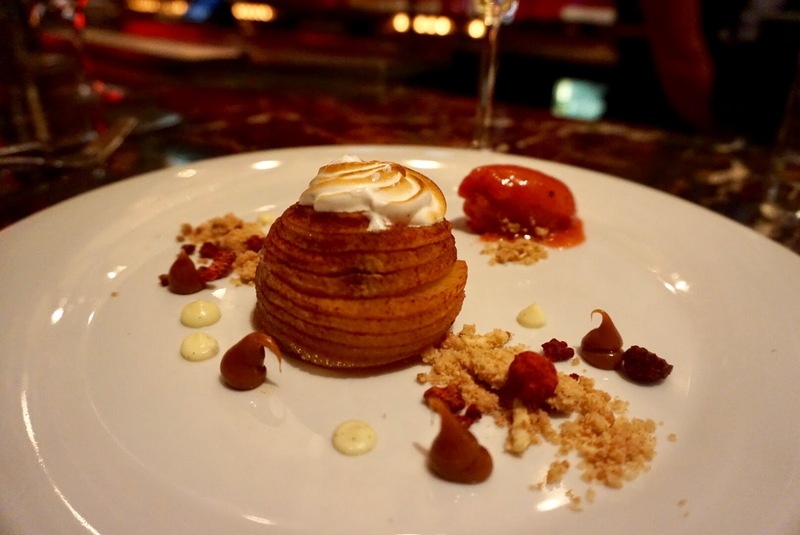 There will be an announcement soon about the next pairing dinner at Council Oak so be sure to follow Seminole Hard Rock Tampa's blog for more details. Council Oak launched a new menu called the Chef's Trio - offered Sunday - Thursday from 5pm-7pm. This is a perfect night out at a great price point. You receive a salad, filet mignon and tuxedo cheesecake for $59 a person. We typically celebrate Valentines Day the day before or day after - I think I know where we are going this year!